Two weeks ago we heard that Xiaomi Mi Mix 3 might eventually arrive on October 15. Since we are already in the second half of the month, the Chinese company technically delivered an announcement - it announced the launch date of the new flagship. 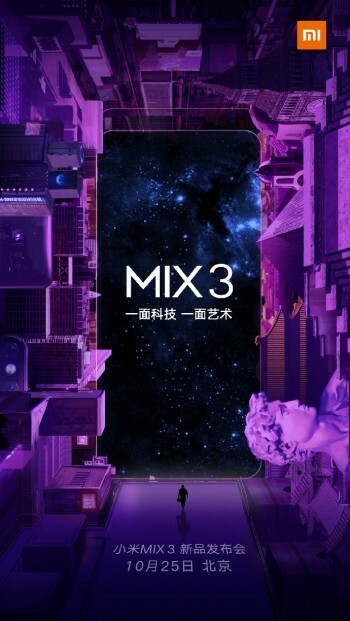 The Mi Mix 3 will arrive on October 25, and it appears the sliding camera mechanism is real, according to the teaser on Weibo. Xiaomi Mi Mix 3 was initially teased with a Find X-esque notch that comes up, but after further investigation, it might be 100% screen-to-body front with a sliding back. There’s also the technical possibility that the display is sliding and the back is stationary, depending on your point of view. We are yet to learn more about the specs of the phone, but we already heard the Mi Mix 3 might arrive with AI dedicated button that will activate Xiao AI. The service came preloaded with Xiaomi Mi Mix 2S, but this is the first time Xiaomi is implementing a hardware solution for its assistant.